Goodbye Hokkaido | PARE MEMBERS' CHAT ROOM! Engineering Faculty have their graduation exam, and at that time 5 Students whose Undergraduate in My Laboratory present about their work in last few months for the graduation exam. 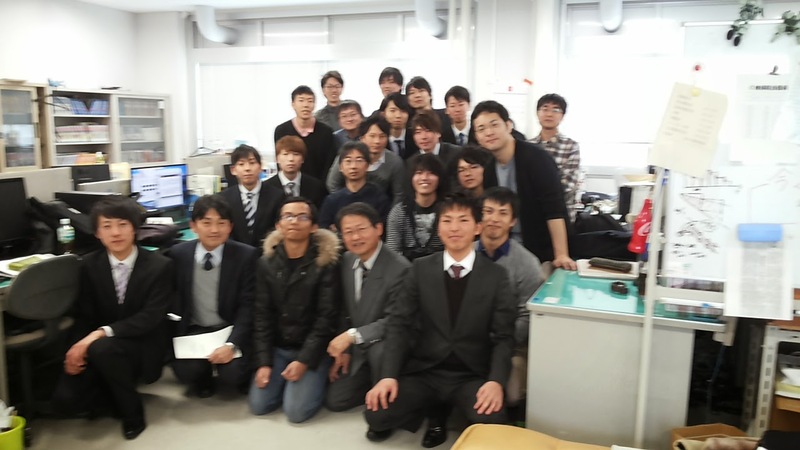 Everyone do their best for the presentation and after they finish their presentation, We gather in My Laboratory and Sensei give the speech, to conglaturate the students, because they finish their study and will graduate soon. After that, Sensei give me the chance to say goodbye for everyone, and then we take photo together for the last time. Thank you very much for Chikahisa Sensei, Tabe Sensei, Suzuki Sensei for your care and teaching. and Matsukawa San, Akabori San, Yanagi San, Shimada San, Ishima San, Takagi San, Kobayashi San, Wakatake San, Horikawa San, Naoya San, Tenjinbayashi San, Azuma San, Uchiyama San, Hayashi San, Azuma San, Akazawa San for helping me in the Laboratory. and Thank you PARE program to give me the chance stay and study in Hokkaido University.